EPOP Newsletter- "The book is a model of social science research and states its conclusions modestly but persuasively…the definitive study on the subject"
New Labour Organiser -"This is a very useful and intelligent review of a surprising long neglected topic…..Such a book is especially welcome at a time of great uncertainty over the fragmentation of mass media." 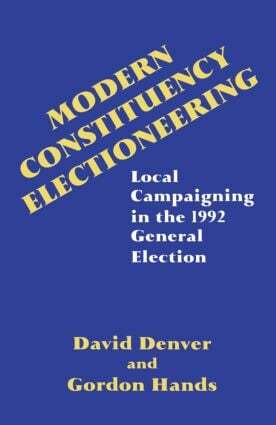 British Politics Group Newsletter - "…every scholar and every library with a special interest in British political parties will want (this book) on their shelves…This is an enourmously significant book for understanding the links between political parties and elections in Britain. Denver and Hands will be cited repeatedly in subsequent efforts to understand those links." Parliamentary Affairs - "This counter-intuitive finding presents a challenge to many modernist assumptions about elections in the age of mass media communications.